Following the success of the Vanguard Collection, Franck Muller introduce the new Vanguard Gravity – a true symbol of technological avant-garde, teamed with a sporty approach, combining perfect lines while evoking the remarkable power of the mechanism. A new concept of tourbillon cage is demonstrated by its innovative elliptical shape and structure in aluminum. The bridge and the pillars of a traditional tourbillon have been turned into a magic and harmonious elliptical circle with diameters of 21.2mm and 7.7mm. 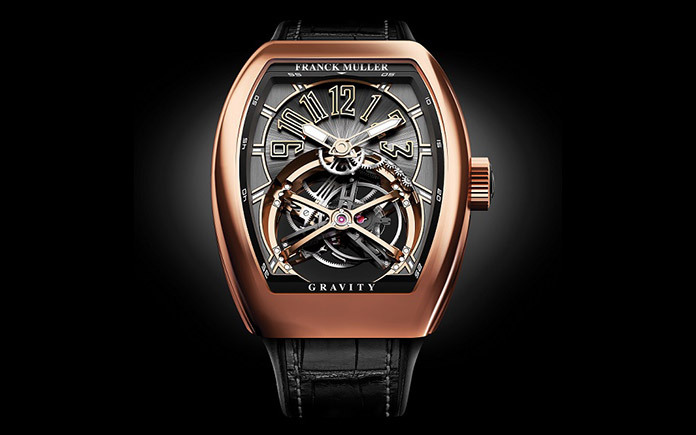 An eccentric balance of 14mm further characterises this unconventional tourbillon. The rubber on the inside of the strap effortlessly takes the form of a daring wrist and makes this model even more harmonious. The strap comes in a variety of finishes including nylon and alligator. They create absolute harmony with the iconic Cintrée Curvex case. Wholly in-house designed and manufactured, the Vanguard Gravity is available in titanium, stainless steel and 18-carat gold. This sporty collection offers a dynamic choice of colorful variants for the bridge. Directly inspired by the universe of astronomy, the Gravity collection is truly the demonstration of a futuristic journey.